PracticeLink.com Summer 2018 29 Exceptional Quality of Life united health services is the largest healthcare system and leading private employer in the Greater Binghamton region. As a locally owned, not-for-profit, 500-bed system, it serves over 350,000 residents in the Southern Tier of New York State and portions of Northeast Pennsylvania. We are a regional referral center for such medical specialties as cardiac surgery, neurosurgery, renal dialysis, neonatal intensive care, trauma care, reconstructive surgery, chemical dependency care and physical rehabilitation. Recruiting: Cardiology, Dermatology, Emergency Medicine, Family Medicine, Geriatrics, Hospitalist, Internal Medicine, Neurosurgeon, Nocturnist, Obstetrics/Gynecology, Orthopedics-Trauma, Otolaryngology, Pediatrics, Psychiatry, Rheumatology, Surgery-Cardiothoracic, Surgery-Trauma, Walk-ins Contact: Lori Walling Physician Recruitment lori_walling@uhs.org (607) 763-6392 uhs.net/careers/physician-opportunities/ psdrecruit.org Your Clinical Career Navigator Where does your career path go? 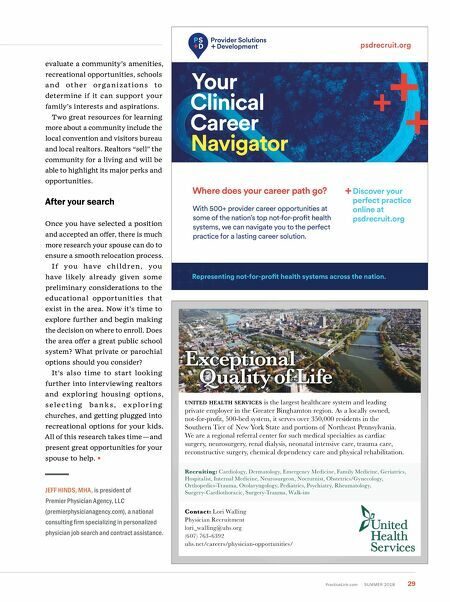 With 500+ provider career opportunities at some of the nation's top not-for-profit health systems, we can navigate you to the perfect practice for a lasting career solution. Discover your perfect practice online at psdrecruit.org Representing not-for-profit health systems across the nation. evaluate a community's amenities, recreational opportunities, schools a n d ot h e r o r g a n i z a t io n s to determine if it can support your family's interests and aspirations. Two great resources for learning more about a community include the local convention and visitors bureau and local realtors. Realtors "sell" the community for a living and will be able to highlight its major perks and opportunities. After your search Once you have selected a position and accepted an offer, there is much more research your spouse can do to ensure a smooth relocation process. I f you h ave ch i ld ren , you have likely already given some preliminary considerations to the educational opportunities that exist in the area. Now it's time to explore further and begin making the decision on where to enroll. Does the area offer a great public school system? What private or parochial options should you consider? It's also time to start looking further into interviewing realtors and exploring housing options, s e l e c t i n g b a n k s , e x p l o r i n g churches, and getting plugged into recreational options for your kids. 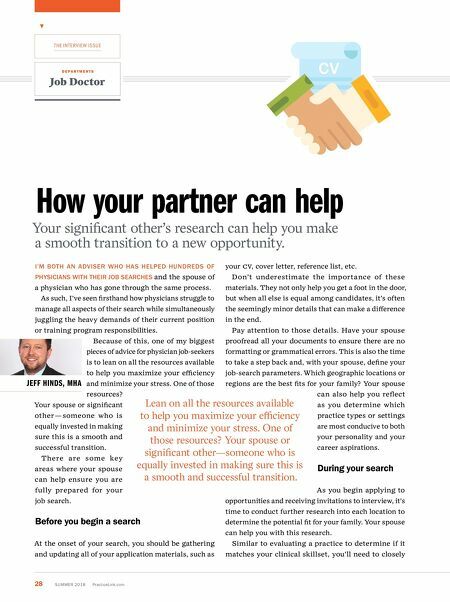 All of this research takes time — and present great opportunities for your spouse to help. JEFF HINDS, MHA, is president of Premier Physician Agency, LLC (premierphysicianagency.com), a national consulting firm specializing in personalized physician job search and contract assistance.